Yatta Lahai and Fatama Alieu — two 30-year-old women in Sierra Leone — are waiting to have surgery that will restore their self-respect. Both women have fistula, a condition caused by prolonged obstructed labor that leaves a woman unable to control her urine, feces or both. Lahai says she lost her husband and the rest of her family because of the condition. Alieu says she avoids going out in public because of the embarrassment. The women are now under the care of the West Africa Fistula Foundation (WAFF) in the city of Bo. The foundation is a safe haven for women, providing food and housing as well as fistula repair surgery. Lahai and Alieu need what is called a urinary diversion, in which doctors essentially create a new bladder. However, the surgery requires general anesthesia — something WAFF and most other health facilities in Sierra Leone cannot provide, due to frequent power cuts and a lack of oxygen tanks. A U.S.-based tech company, Gradian Health Systems, thinks it has found a way around the problem. Gradian manufactures and sells the Universal Anesthesia Machine, called a UAM, and has sold the device to 23 developing countries. Several already are in use in Sierra Leone. Lina Sayed is the vice president of market strategy for Gradian. She says the machine is useful because, in an emergency, it can operate without electricity or an outside source of oxygen. "When the electricity goes out, [the machine] pulls into draw over mode. Draw over mode is an old technology which has been built into our machine. It pulls in room air, which is 21 percent oxygen, and you mix it with the anesthetic agent and you can actually ventilate the patient and get him through surgery if you lose oxygen and electricity," Sayed said. Sayed says the UAM's monitor has a battery backup, so doctors can measure the amount of oxygen that goes into the patient. Dr. Augustine Mannah works at WAFF in Bo, one of the places Gradian is looking to install a machine. Mannah said he currently uses ketamine or a spinal block to perform surgeries. Being able to use general anesthetic would be beneficial, he says. "Definitely, it will help us because we really need to have the patient relaxed," he said. "They are not supposed to be fighting, but sometimes with ketamine that can happen, with spinal it can happen, but once we can intubate the patient, then we can ensure we can concentrate on the surgery." The UAM is expensive. Each device can cost up to $23,000. 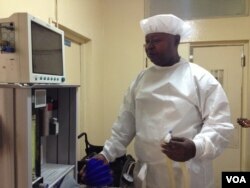 But Gradian will install more UAM's in government hospitals around Sierra Leone, and train staff to use them. Currently, 15 UAMs have already been installed across the country." One of the challenges is maintaining the UAMs, says Dr. Michael Koroma, an anesthesiologist with the Ministry of Health and Sanitation who works at a local hospital in Freetown that has a UAM. "If you have locally trained staff to maintain the function of machines and to repair the machines when there are faults, then I think it's an advantage to the country," Koroma said. Lahai and Alieu hope WAFF can get the money needed to install the machine. Then, perhaps, they can restart their lives, and walk proudly again.